Tiny Fish must escape from the toxic ocean! Eat cookies, avoid toxic particles and escape from looming predators like the urchin fish or the deadly black fish. Survive in these lethal waters! 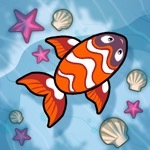 Tiny Fish is a cartoon action game where you have to tilt your device in order to guide the fish and survive. This game has a 3.7 star rating (1442 ratings). It occupies the 249902th position in our ranking with 57 points. It is among the 10% best ones of its category and among the 10% best ones of the overall top.